STIHL petrol hedge trimmers are ideal for park, garden and landscape maintenance. They are characterised by their hard-wearing construction and practical features. 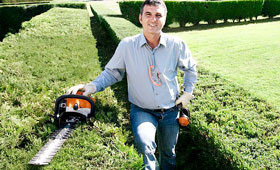 Depending on the intended use, the equipment comes as either the T version for trimming hedges with thin branches or R version for cutting back overgrown or woody hedges.